There are lots of Windows 10 laptops to choose from these days, and as you might expect, some are better than others. 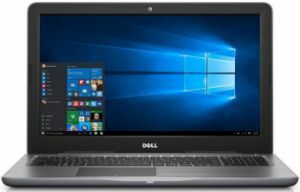 I’ve spent some time checking a few of them out, and my favorite moderately priced Windows 10 laptop so far is the brand new Dell Inspiron 15 5000 Series i5567-1836GRY. This is a very capable machine, offering plenty of power and functionality for most any computing task. As you can see, there is a lot to love inside this machine. No laptop is perfect of course, and this one is no exception due its less-than-stellar battery life. But quite honestly, that’s about the only real negative I found with this machine. Windows 10 comes pre-loaded on this system which means you won’t have to worry about upgrading the Windows installation for some time to come. Simply install the periodic updates as they are released and you’ll be all set. Bottom line: I really like the look and feel of this laptop. It offers plenty of power for most any computing task, up to and including photo/video editing and moderate gaming. Click here to read more about the Dell Inspiron 15 5000 Series i5567-1836GRY laptop on Amazon.